Cyber Monday camera deal: DJI Mavic Air camera drone for just $649 ! This amazing one-day drone deal popped up over night at B&H Photo, and is one of the most Cyber Monday camera deals we have seen so far in the USA. The original DJI Mavic Air is one of the most popular camera drones out there - and the perfect starter drone for anyone who fancies getting into aerial photography. At $649 the basic camera is being sold in this one-day deal for just $649... that's $150 less than the RRP, and a $50 cheaper than we can find it elsewhere. 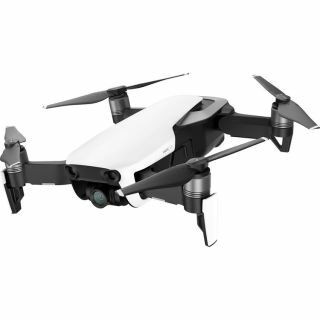 The $649 price is for the standard drone package, but B&H are offering the DJI Mavic Air Fly More option which adds in a load of extras (such as really useful spare batteries and a case) for an equally enticing discount price of $719. The Mavic Air is a stunning technical achievement, an incredibly capable 4K drone that – for most people – would seem to be the only flying camera they’d ever need. With front, downward and rear-facing distance sensors, the drone is capable of identifying obstacles and not just warning the pilot, but also plotting a course to avoid, say, a wall or a tree if needed.